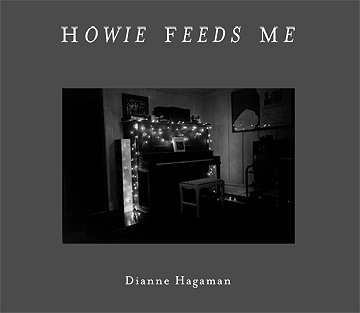 Dianne Hagaman conceived of Howie Feeds Me as a visual hypertext, a photographic equivalent in the tradition of Georges Perec, Michael Joyce, and other pioneers of literary hypertext. It contains 164 photographs, arranged as visual sonnets containing (more or less) fourteen images each. Some sonnets consist of single images presented one at a time, while others have been made into continuous loops the viewer scrolls through. Together, they portray a complex social and emotional reality, dealing with questions of intimacy, love, and the development of relationships. Dianne Hagaman is an author and photographer who lives and works in San Francisco. She has also published How I Learned Not To Be A Photojournalist (University Press of Kentucky). Howie Feeds Me is available for free download. These files are quite large. If you don't have DSL or a similar fast connection, the download time will be unacceptable. click to download IBM file (90 megabytes) Download the entire file, then click on it and it will automatically unpack. click to download MAC file (84 megabytes) After the .sit file downloads, it will decompress into a folder called "Howie Feeds Me." Copy the entire folder, not just the application inside it, to your hard drive. Otherwise, some necessary hidden files will not be copied and the application may not run properly. Whichever version you download, please make sure that your screen resolution is set to at least 1024x768. Otherwise you may not be able to see the navigation tools at the bottom of the screen. Click here for Michael Joyce's essay on Howie Feeds Me. Howie Feeds Me is also available as a CD-ROM from the Visual Studies Workshop. Click here for further informatinon.. This version is based on a slightly older version of Macromedia Director, and it runs on Macs in Classic Mode, and on Windows machines running Windows 98 (Windows machines using later operating systems can be tweaked so that the CD-ROM runs on them too).